How much waste do you produce? How much of your garbage do you recycle? Did you know that styrofoam doesn't ever break down? That means that all styrofoam just ends up sitting in a landfill adding to the unhealth of our planet (and therefore us). It amazes me how many food places STILL use styrofoam containers!! Just crazy when there are better options available! There are many more creative ideas for reducing the amount of garbage we produce on this page. Take a look - there may be some things here that you had never even thought of before. Share some ideas of your own in the comments section at the bottom of the page. With the never ending amount of health information out there, do you find yourself getting confused and overwhelmed? Is it hard to know who to listen to or what to do first? Well, sit back and relax with this f*ree 7-Day Holistic Health e-Course. Sign up and receive one e-mail a day for 7 days. This is a great course with simple and easy to follow information and tips. It is designed to present you with basic common sense facts that are, too often, overlooked these days. Check this course out if you are just beginning your health journey or if you are already well on your way - there is inspiration within for all! Click here to sign up for this 7-Day Holistic Health Course. Flossing our teeth is an important part of our dental health. Before you start flossing, rub one drop of peppermint essential oil over the length of the piece of floss you are using. A good quality peppermint essential oil has properties that are anti-microbial, anti-viral and antibiotic. So, by using just a drop of essential oil on your floss you are getting the advantage of these properties on your gums, in between your teeth, where buildup and problems often happen. 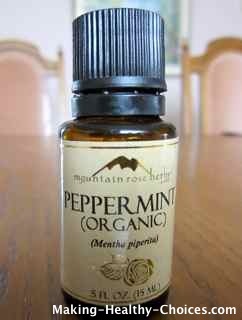 Be sure to use a good quality (therapeutic grade) peppermint essential oil. Here is my recommended place to buy essential oils. Your mouth will be left with a minty fresh feeling that will help to uplift your entire spirit. How's that for a boost? Yes, there is mint flavored dental floss that you can buy BUT do you know what exactly they are using to create that minted flavor? By using your own high grade essential oil you will be sure to be getting all the healthy properties of peppermint oil without any of the unhealthy chemical additives that could be in those mint flavored flosses from the store. Caution: Essential oils are very concentrated so one drop is plenty. Be careful to not touch your eyes after using the oil as this will cause a stinging sensation in your eyes. If you like this e-zine please share it. If it's been shared with you please subscribe here.